Afghan President Hamid Karzai buried his assassinated brother on Wednesday, then swiftly gave another brother a key role opened by the killing, in what could be a bid to stave off political infighting in the volatile south. 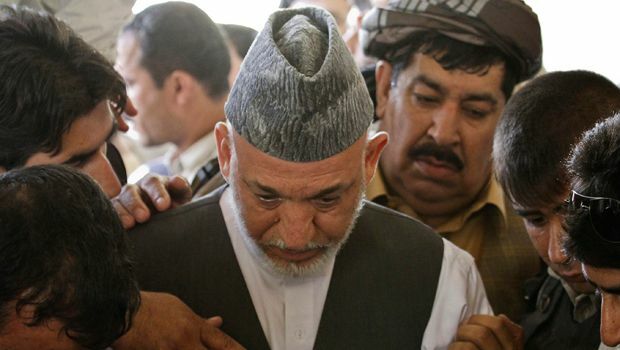 President Karzai wept and kissed the face of his dead brother Ahmad Wali Karzai, unofficially the most powerful man in southern province Kandahar, at a burial in their ancestral village attended by thousands of mourners. Only hours after the body was lowered into the ground, the president appointed another brother, Shah Wali Karzai, as de facto leader of the Popalzai tribe to which the Karzai family belongs. Two explosions were heard in Kandahar city by a Reuters witness soon after the burial, but officials said the ceremony passed without security problems. Foreign forces said they had carried out controlled detonations at a nearby airfield. In another sign of the volatility of southern Afghanistan, the governor of neighboring Helmand province escaped an early morning bomb attack on his motorcade en route to the burial. Two security officials were injured in the attack in Kandahar’s Maiwand district but the governor was unhurt and attended the burial, his spokesman Daoud Ahmadi said. Ahmad Wali Karzai, a younger half brother of the president, whose influence belied his modest title as head of the Kandahar provincial council, was killed by a trusted family security guard at his home on Tuesday. 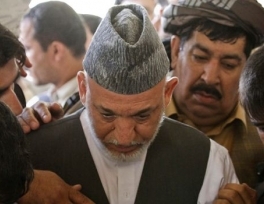 President Karzai flew to Kandahar hours after his brother was shot and led a burial procession under a tight security blanket from the center of Kandahar city to the family’s home in the village of Karz, some 20 km (12 miles) away. He was accompanied by his family and some of Afghanistan’s most influential leaders, including at least one possible successor to Ahmad Wali Karzai’s unofficial crown, Gul Agha Sherzai, currently the governor of eastern Nangarhar province. The president knelt by the side of his brother’s grave, weeping as the crowds looked on. “I came here to mourn the death of Ahmad Wali Karzai. He was our only hope for everything in Kandahar,” cried one mourner, Khan Agha, as attack helicopters circled. The Taleban claimed responsibility for one of the most high-profile assassinations of the last decade. They have in the past taken responsibility for attacks in which security services have questioned their role. Ahmad Wali Karzai’s power stemmed from his tribal and family connections and the fortune he accumulated. While outranked by the province’s governor, he held the real power and was considered Karzai senior’s envoy in the south. He had been accused of amassing a fortune from the drugs trade, intimidating rivals and having links to the CIA — charges he strongly denied and his brother said were not proven. His death has left a gaping hole in the south where power is largely determined along tribal and ancestral lines. “Tribal leaders have proposed for me to replace martyred Ahmad Wali Karzai with Shah Wali Karzai as your tribal elder,” the president said to hundreds of people thronging the governor’s compound in Kandahar city after the burial. Tribal leaders stood up and raised their hands in support, a Reuters witness said. Several elders then stepped forward to place the turban of his slain brother onto Shah Wali Karzai’s head. But the relatively unknown Shah Wali Karzai, even as head of the tribe, may struggle to fill the power void created by his brother’s death. Shah Wali Karzai is a businessman and engineer by training, who travels regularly between Dubai and Kandahar. “What seems certain is that nobody can entirely replace Ahmad Wali (Karzai) in holding the south together as he did,” wrote Pakistani author and expert on Afghanistan Ahmed Rashid in the New York Times. On the list of those tipped to possibly replace Ahmad Wali Karzai as the main power-broker in Kandahar is Gul Agha Sherzai, an ally of the president, who served as Kandahar’s governor until 2004 when he was removed by the president and sent to Nangarhar. He flew down for the burial. “This is one of the saddest days for Afghan people, I came here to give my deepest condolences. He was killed in a cowardly manner, the plotters will be severely punished,” Sherzai told Reuters.